#VaeppampooThuvaiyal #NeemflowerChutney : #Neemflower starts blooming in the month of March or April. The flowers have a distinct aroma and taste bitter. These flowers that fall from the tree are collected by spreading a clean cloth under the neem tree. Then these flowers are dried in shade. These dried leaves are stored in an air tight container for furthur use. Neem flowers are rich source of antioxidants. It expels intestinal worms of kids. It also helpful in treating many ailments related to stomach. The dried flowers can be mixed with honey and stored in a clean and dry bottle. This can be taken daily on an empty stomach in the morning to get full benefit of these flowers. Now let us see how to prepare a thuvaiyal [ chutney ] with neem flower. A small quantity of jaggery is added to reduce the bitterness of the flower. The flower is also sauteed with ghee to make its bitterness mild. Soak tamarind in a small bowl with 3 tsp of lukewarm water. Heat a kadai with oil over a medium flame. 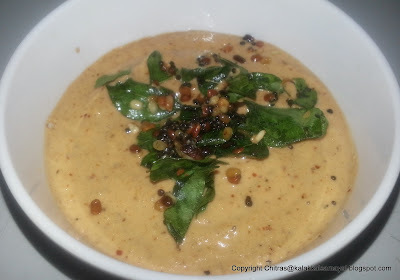 Roast red chilly,urad dal and asafoetida. Now add ghee and add neem flowers. Saute for a few seconds or until it gives our nice aroma. Turn off the stove and transfer into the same bowl. Now take all the ingredients along with roasted ones in a mixie jar. This is an excellent side dish for pongal and upma. This can also be mixed with white rice adding a tsp of gingelly oil. Enjoy neem thuvaiyal mixed rice with any sambar. This thuvaiyal goes well with curd rice also.